The importance of quality-of-life (QOL) measurements in cancer management is being increasingly appreciated. This is especially important in patients with advanced cancers. Over 80% of women with epithelial ovarian cancer (EOC) will present with disease outside the ovary as there are no accurate screening tests, and symptoms usually do not develop until EOC has spread. Standard treatment includes debulking surgery followed by chemotherapy to which most women will have a complete response but only a minority of women with advanced disease will be cured. Fortunately, advances in surgical and chemotherapeutic management have improved overall survival with 45% of women of all stages living 5 years or longer. EOC may in many cases be considered a “chronic cancer,” which highlights the importance of QOL in management decisions. QOL may be affected by the disease itself as well as by surgical and chemotherapeutic treatments. Future studies of the care and treatment of EOC patients should include well-designed QOL evaluations. 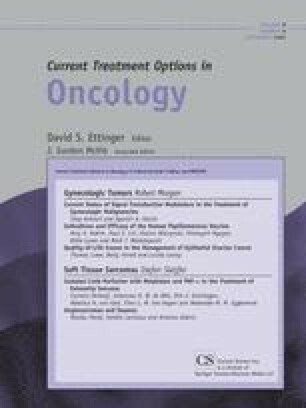 Third and most recent large phase III randomized study showing superiority of combination IV and IP chemotherapy over IV chemotherapy alone. First large randomized phase III study of intraperitoneal chemotherapy. Second large randomized phase III study of intraperitoneal chemotherapy. Established carboplatin and paclitaxel as standard of care for primary postoperative therapy for EOC. Randomized phase III study comparing docetaxel versus paclitaxel in combination with carboplatin. Global QOL was similar many symptom scores favored docetaxel. The current primary postoperative chemotherapy recommendation is for paclitaxel or docetaxel in combination with carboplatin.